The authors would like to thank Lord Ralph Kerr of Melbourne Hall for his support in allowing the use of texts held in the Melbourne Hall Muniments. 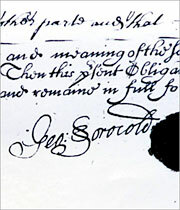 They would also like to thank the staff of Derbyshire Records Office and Derby Local Studies Library, who assisted in the research for this biography, and Stephanie Hitchcock (local researcher, Belper, Derbyshire) and Max Craven (historian, Derby) for their helpful comments and inputs. The work of Robin Clarke, of Armitage in Staffordshire, in researching documentation from the Litchfield, Stafford and Derby archives is gratefully acknowledged, as are the efforts of Jane Joyce and the engineering timelines team in the editing of the final draft.